We are extremely honoured that Her Royal Highness The Countess of Wessex is our Royal Patron. Sophie, Countess of Wessex, GCVO is the wife of Prince Edward, Earl of Wessex, the youngest son of Queen Elizabeth II and Prince Philip, Duke of Edinburgh. Married in 1999, she worked in public relations until 2002 and now assists her husband in his various activities. The Earl and Countess have two children: James, Viscount Severn, and Lady Louise Windsor. Iain was Chairman of the Trustees from 2004-2014. He was formerly Chairman of the Bath & Wells Diocesan Board of Education for ten years. Before retiring from full-time work, Iain taught in the secondary schools sector, was a lecturer in the University sector, and an Inspector of Schools. Iain is an Hon. Fellow of the University of Worcester. He is married to Prebendary Helen Ball OBE, a governor of Wells Cathedral School. They have two sons and two granddaughters. For 28 years James Bowman has been one of the world's foremost and most influential coutertenors. His career spans opera, oratorio, contemporary music and recitals. After education at Oxford, he made his début with Benjamin Britten in 1967 and was soon in demand on the opera stage and on the concert platform. He appeared at Glyndebourne in 1970, at the English National Opera in 1971 and at Covent Garden in 1972. His concert career is equally wide-ranging and he has made over 130 recordings with all the major record labels and with such directors as Harnoncourt, Leonhardt, Hogwood, Pinnock and Frans Brüggen. His recorded repertoire covers not only the usual Baroque works but also embraces such works as Orff's Carmina Burana, Jacques Loussier's Lumières and Britten's A Midsummer Night's Dream, a work with which he has a particularly long association. James Bowman has given the world premières of many important contemporary compositions, including works by Benjamin Britten, Michael Tippett, Peter Maxwell Davies, Richard Rodney Bennett, Robin Holloway and Michael Nyman. Iestyn sang as a chorister in the choir of St John's College, Cambridge. He began singing countertenor in his teens, at Wells Cathedral School. He returned to St John's as a choral scholar and, after graduating in Archaeology and Anthropology, Iestyn studied at the Royal Academy of Music, London. On the opera stage, he has appeared at the Metropolitan Opera, New York; the Chicago Lyric Opera; La Scala Milan; the Royal Opera House, Covent Garden; English National Opera; Glyndebourne Festival Opera; Welsh National Opera, and in Munich, Vienna and Zurich. Concert highlights include performances at La Scala Milan; the Concertgebouw, Amsterdam; Tonhalle, Zurich; the Théâtre des Champs-Élysées, Paris; Lincoln Centre, New York and the BBC Proms. He has appeared in concert and recital at Carnegie Hall and regularly appears at Wigmore Hall, where he has curated his own Residency. He recently delighted London theatre audiences singing the role of Farinelli, in Farinelli and the King with Mark Rylance at the Globe Theatre and subsequently on the West End stage at the Duke of York’s theatre. A prolific recording artist, he is the recipient of the Royal Philharmonic Society’s 2010 Young Artist of the year prize, the 2012 Gramophone Recital Award, the 2013 Critics’ Circle Awards for Exceptional Young Talent (Singer) and the 2014 Gramophone Recital Award for his disc Arise, my muse on the Wigmore Live label. Iestyn received his MBE in the 2017 New Year Honours for services to music. Welsh bass-baritone Neal Davies made his Royal Opera debut in 1997, singing Satyr (Platée) at the Barbican in a production with the Mark Morris Dance Group. He went on to sing Figaro (Le nozze di Figaro) with The Royal Opera at Shaftesbury Theatre in 1998 and has since returned to sing Alaska Wolf Joe (Rise and Fall of the City of Mahagonny) for The Royal Opera on the main stage. Davies studied at King’s College, Cambridge, the Royal Academy of Music and the International Opera Studio in Zürich. Awards early in his career include the Lieder Prize at the 1991 Cardiff Singer of the World Competition. He performs regularly for Welsh National Opera, where his roles include Zebul (Jephtha), Papageno (Die Zauberflöte), Guglielmo and Don Alfonso (Così fan tutte), Dulcamara (L’elisir d’amore) and Sharpless (Madama Butterfly). Other appearances include Pallante (Agrippina) for Berlin State Opera, Ko-Ko (The Mikado) for Lyric Opera of Chicago, Bottom (A Midsummer Night’s Dream) for Garsington Opera and Ariodates (Xerxes) and Dr Kolenaty (The Makropulos Case) for English National Opera. Davies is renowned for his interpretations of baroque repertory and works regularly with leading period ensembles. Engagements include Saul (Charpentier’s David et Jonathas) in Aix-en-Provence, Edinburgh and New York with Les Arts Florissants, Handel’s Belshazzar in Aix-en-Provence, Berlin and Innsbruck under René Jacobs, Valens (Theodora) with Les Arts Florissants in Paris and Salzburg and on tour with The English Concert and Handel’s Athalia with Concerto Koeln. Musically steeped in the rich Anglican choral tradition, American composer Gary Davison brings a deep love of this heritage to all of his writing. Through the lens of the post-modern era, he embraces many of the modal and tonal techniques of Western music to inform his own artistry. Performers, audiences, and critics alike favourably regard his compositional style for its idiomatic expression and freshness of voice. Mr Davison’s has long been a great friend of Wells Cathedral Choir, for whom he has written a number of works. The choir has recorded two albums of Gary's music, the second of which is due for release later in 2017. Jonathan Dove (b1959) is a hugely versatile composer who is perhaps best known for his remarkable canon of operas which range from the hugely successful comic opera Flight, based on a group of people trapped together in an airport for twenty-four hours, to works written especially for television, community operas, and a series of works scored for period instruments. In an interview for Time Out in November 2009 he said: ‘I remember in my early teens reading The Hobbit and playing along with it on the piano, translating it into music ... Around that time I also built model theatres of increasing sophistication—the last one used up all of my Meccano set and had ultraviolet lights and a hydraulic revolving stage.’ It is hardly surprising, then, if this instinct for the dramatic also informs his church music at every turn. He has written a great deal of choral music, including works written especially for Wells Cathedral Choir. Dame Elizabeth Periam Gass, Lady Gass DCVO JP was Lord-Lieutenant of Somerset from 1998 to 2015. Having graduated from the University of Cambridge, Lady Gass worked as a schoolteacher, teaching mathematics. 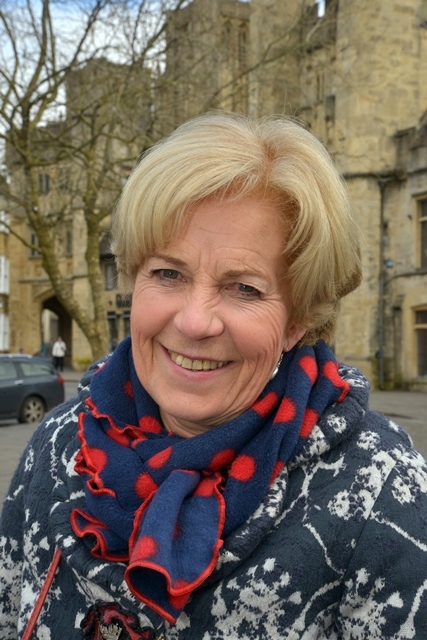 In 1985 Lady Gass was elected to Somerset County Council, as a Conservative Party Councillor for the Quantock district, and remained a member until 1997. From 1989-93 she was Chairman of the Exmoor National Park Committee and at the same time was Vice-Chairman of the county council's Social Services Committee. In 1994 she was High Sheriff of Somerset, the next year was appointed a Deputy Lieutenant for Somerset, and in 1996 was promoted to Vice Lord-Lieutenant and appointed as a Justice of the Peace for the county. In 1998, she became Lord Lieutenant of Somerset, a position she still held until 2015. A former chorister, Howard Goodall is an EMMY, BRIT, Gramophone and BAFTA award-winning composer of choral music, stage musicals, film and TV scores, a highly respected broadcaster and an energetic campaigner for music education. In January 2007 he was appointed as England's first ever National Ambassador for Singing. His settings of Psalm 23 and Love Divine are amongst the most performed of all sacred music in the UK and have featured on numerous platinum-selling CDs. His Eternal Light: A Requiem earned him a Classical BRIT award for Composer of the Year. He is also Composer-in-Residence for Classic FM and has released four best-selling choral discs for the station: Enchanted Voices, Enchanted Carols, Pelican in the Wilderness, and Inspired. The Rt Revd Peter Hancock read Natural Sciences at Selwyn College, Cambridge and then studied for ordained ministry at Oak Hill Theological College. Bishop Peter was born in Kent in 1955 but grew up in the Isle of Wight before his family moved to Fareham, Hampshire when he was aged 11. He is a member of the Society of Ordained Scientists and has an interest in the relationship between science and Christianity. Children and young people have been at the centre of his ministry. Previously he has undertaken youth work in parishes, helping organise venture holidays. He was also district scout chaplain and has a long association with scouting and guiding that he will look to continue in Somerset. Peter and Jane have four grown-up children, Claire, Richard, Charlotte and William. Claire is a tropical agriculturalist. She travels extensively and works for Tearfund as a Global Food Security Officer. Richard trained as an engineer and is now an insurance broker in the City. Charlotte is a physiotherapist working in University College Hospital. William is an engineer and has just begun working for an engineering consultancy firm. All four children live and work in London. Lady Marina Hobson is a philanthropist and supporter of the arts, for which she received and MBE in 2000 and OBE in 2011. As well as being an ardent supported of choristers, Lady Hobson has also supported the Royal Opera House for over 12 years, funding core as well as production costs. She has provided scholarships for young dancers and supported the Royal Ballet’s Chance to Dance programme, giving more than 20,000 children a chance to try ballet. Dame Emma Kirkby has long been a friend of Wells Cathedral Choir and has performed with the choir both in concert and on a CD recording, Visions of Jerusalem. The Trust was delighted to welcome Dame Felicity Lott to Wells when she performed with the choristers in concert in 2013. Dame Felicity is one of Britain’s best-loved sopranos. In opera, her portrayals of the Strauss and Mozart roles in particular have led to critical and popular acclaim worldwide. Her concert engagements have taken her to the major orchestras, working with Rattle, Haitink, Mehta, Previn, Masur, Welser-Möst, Sawallisch and Sir Andrew Davis. Much of her concert and recital repertoire is recorded, as are many of her great operatic roles: from her wonderful Marschallin under Carlos Kleiber to her Belle Helene, with which she enchanted the Parisians when she sang the role for the first time at the Chatelet in Paris in 2000. A founder member of The Songmakers’ Almanac, Felicity has appeared on the major recital platforms of the world and in June 2005 she celebrated the 30th anniversary of her recital debut at the Wigmore Hall, with whom she has a particularly close association and received the Wigmore Hall Medal in 2010 for her exceptional contribution to the hall. Raval went on to study at the Guildhall School of Music and Drama, the Royal Academy of Music and the National Opera Studio. She was a finalist in the BBC Cardiff Singer of the World Competition in 2011, and is the winner of the Dame Eva Turner Prize for ‘Soprano with Dramatic Potential’. Her operatic engagements include Cio-Cio-San (Madama Butterfly) for English National Opera, Donna Anna (Don Giovanni), Lisa (The Queen of Spades) and Ortlinde (Die Walküre) for Opera North, Nedda (Pagliacci) for Welsh National Opera and Countess Almaviva (Le nozze di Figaro) for the RAM under Colin Davis. Concert engagements include Simply Gershwin in UK concert tour with Raymond Gubbay, Beethoven’s Ninth Symphony with Fondazione Orchestra Sinfonica e Coro Sinfonico di Milano Giuseppe Verdi, Milan, and Ortlinde (Die Walküre, Act III) in concert with WNO.